Aim: To evaluate the effectiveness of Canal Brush technique removal Ca(OH) 2 from the root canal system using Scanning Electron Microscope (SEM). Materials and Methods: Eighteen teeth were instrumented up to #40 and dressed with Ca(OH) 2 . Ca(OH) 2 was removed with master apical file (MAF) (Group 1, n:6) and CanalBrush technique (Group 2, n:6). Six teeth served as positive and negative controls. The roots were splited in the buccolingual direction and prepared for SEM examination. Two examiners evaluated the wall cleanliness then statistical analysis was performed by Mann-Whitney U and Friedman tests. Results: Differences in cleanliness were observed between Group 1 and Group 2 in the apical thirds (P=0.002). In the coronal and middle thirds, there were no differences between the two groups. Conclusions: It is essential to re-instrument the root canal walls using instrumentation techniques while irrigating with NaOCl and EDTA combination. The Canal Brush technique results in the packing effect of the Ca(OH) 2 through to the apex. During the early 1990s, Keiret al. reported that the Endobrush improve canal debridement. Their results showed that Endobrush was significantly better than instrumentation alone in debriding the root canal. However, the Endobrush could not be used to full working length because of its size might lead to packing of debris into the apical section of the canal after brushing. The Canal Brush (Roeko Canal Brush TM , Coltène/Whaledent, Langenau, Germany) is an endodontic microbrush recently introduced. This highly flexible microbrush is molded entirely from polypropylene and can be used manually with a rotary action. However, the brush was more efficient when operated at 600rpm in a contra-angle handpiece. Garip et al. reported that irrigation and brushing combination was not significantly better than irrigation alone in removing the smear layer on the canal walls. It is considered that, the use of small and flexible Canal Brush with irrigation solutions removes debris effectively from root canal extensions and irregularities, but still there are not enough number of studies about that kind of tools and kits to remove debris from the root canals. The hypothesis is that the Canal Brush might be more effective technique for removing Ca(OH) 2 from the root canal system than other currently used techniques. 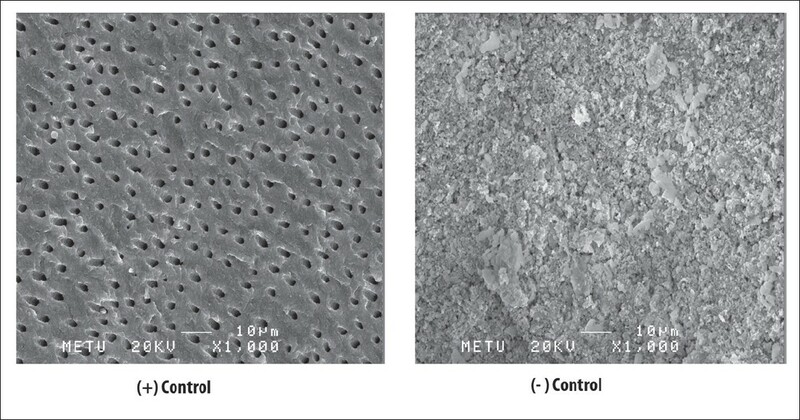 Therefore, the present study was designed to evaluate the effectiveness of Canal Brush technique in removing Ca(OH) 2 from the root canal system by using the scanning electron microscope (SEM). In this study, after ethics committee approval, eighteen freshly extracted human single-rooted teeth with mature apices were used. Preoperative mesiodistal and buccolingual radiographs were exposed of each root to confirm the canal configurations. The crowns of the teeth were removed 14mm from the apex to standardize their length. A size 10K-file was placed in the canals until it was visible at the apical foramen. The working lengths were determined by subtracting 1mm from this measurement. All roots were prepared using ProTaper rotary system (Dentsply, Maillefer, Ballaigues, Switzerland) to a # F4 (#40, 6% apical third taper) instrument as the MAF. During the preparation 1mL of 2.5% NaOCl was used for irrigation after each instrument. RcPrep (RC-Prep, Premier Dental, Norristown, PA) chelating agent was used as lubricant. The irrigant was delivered via a 30 gauge endodontic irrigation needle that was inserted into the canal to 1mm short from the working length.Teeth were irrigated with 5mL 2.5% NaOCl and 5mL 17% EDTA for 1minute for final flush. Root canals were dried with paper points (Spident, Incheon, Korea). All preparations were done by the same clinician. The teeth were randomly assigned into two experimental groups (n=6). The remaining teeth served as positive (n=3) and negative (n=3) controls. The chemically pure (95%) Ca(OH) 2 powder (Merck KGaA, Darmstadt, Germany) was mixed with distilled water in 1:1 ratio of volume. In the Group 1 and 2, Ca(OH) 2 was placed into the canals with # 30 lentulo (Mani Inc., Tochigi, Japan) until the material extruded through the apex. Cotton pellets were placed in all canal orifices and teeth were temporarily restored with temporary cement (Nucavfil PSP Dental Co. Ltd., Belvedere, Kent, UK). Afterwards mesiodistal and buccolingual radiographs were taken to confirm complete filling. All teeth were left in 100% humidity for 1 week at 37°C. One week later, temporary restorations were removed and different techniques were used to remove Ca(OH) 2 from the root canals. Root canals were cleaned using hand instrumentation technique with #40K-file (MAF) with circumferential motion until #15K-file could be seen from the apical foramen. Then, irrigation was done with 5mL 2.5% NaOCl and 5mL 17% EDTA. Root canals were cleaned using #40K-file (MAF) with circumferential motion. Then irrigation was done with 5mL 2.5% NaOCl and 5mL 17% EDTA, and a medium-sized Canal Brush was placed in a slow-speed handpiece running at 600rpm and advanced to the working lenght. A circumferential motion was made with the Canal Brush for 30 seconds. The negative control did not receive Ca(OH) 2 material and the positive control received intracanal dressing but no subsequent removal. After instrumentation, the roots were grooved vertically on the buccal and lingual surfaces, using a water-cooled diamond bur and taking care to avoid touching the root canal. All roots were split in the buccolingual direction using a chisel and mallet, and each sample was divided into three equal parts as apical, middle and coronal thirds by making small grooves with a sharp knife on the side of the root. The samples were dehydrated by a serious of graded ethanol solutions and then coated with a gold layer, and then evaluated using the SEM (JEOL JSM-6400, Japan) at × 1000 magnification. To standardize the area examined for each sample, the technique described by Paque et al. was used. For this purpose, the central beam of the SEM was directed to the center of each third of the root canal by the SEM operator under 10 × magnification. Then the magnification was increased gradually to × 2000 and the area of the canal wall captured on the screen of the SEM was used for scoring the sample. Criteria for the degree of Ca(OH) 2 removal and cleanliness of the dentinal walls were established by modification of the scoring system of Salgado et al. Two calibrated examiners analyzed independently and in a blind manner the removal of Ca(OH) 2 and the cleanliness of the dentinal walls using a 4-grade scale [Table 1]. The scores were compared and when a difference was found, the evaluators re-evaluated the samples. If they could not reach agreement, a third evaluator helped with scoring of the sample. Statistical analysis was performed by Statistical Package for Social Sciences (SPSS) 11.5 software (SPSS Inc., Chicago, IL, United States). Data were expressed as median (min-max). The differences between techniques were evaluated by Mann-Whitney U test. Determining the differences among regions within techniques was analyzed by Friedman test. When the P value from the Friedman test statistics are statistically significant Wilcoxon Sign Rank test was used to know which regions differ from which others. A P value less than 0.05 was considered statistically significant. 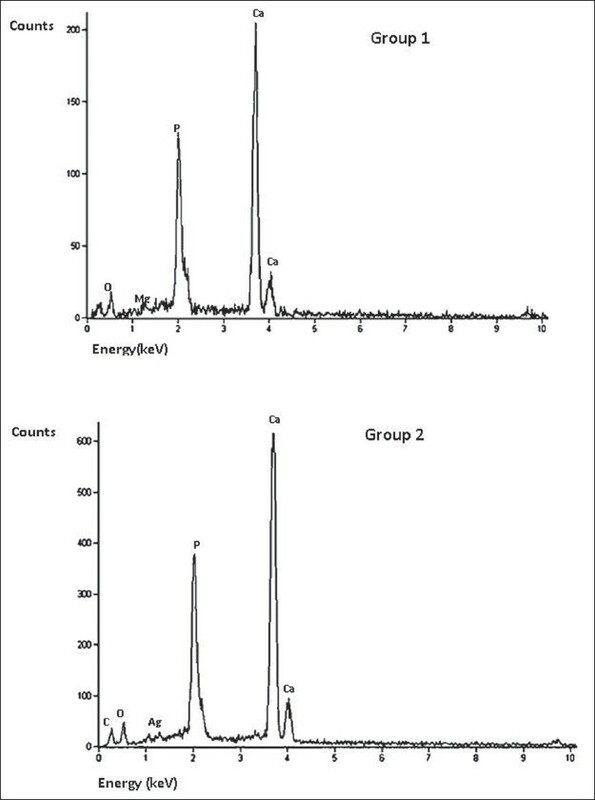 Spectrum microanalysis was performed using the energy table for Energy Dispersive X-ray Spectroscopy (EDS) analysis (NORAN System SIX Spectrum Microanalysis, Model 300, Thermo Electron Corporation, Middleton, WI, USA) to confirm whether the remnant was Ca(OH) 2 or debris. In all of the specimens studied by SEM, it was demonstrated no presence of smear or debris in the root canals. In all positive controls, the canal surface was covered by Ca(OH) 2 [Figure 1]. The median (min-max) value for apical, middle and coronal thirds of Groups 1 and 2 are shown in [Table 2]. Differences in cleanliness were observed between Group 1 and Group 2 in the apical thirds (P=0.002). In the coronal and middle thirds, there were no differences in cleanliness between the two groups (P=0.699 and P=0.394 respectively). When each group was evaluated separately, in Group 1 there was no statistical difference in cleanliness among the apical, middle and coronal thirds (P=0.223); however, in Group 2, a difference in cleanliness was observed between the apical versus the middle and coronal thirds (P=0.024 and P=0.020 respectively). There were no differences between middle and coronal thirds (P=0.317) [Figure 2]. Spectrum microanalysis revealed that the remnant was Ca(OH) 2 in each group [Figure 3]. It has been reported that residual Ca(OH) 2 on the root canal surface interact the penetration of sealers into dentinal tubules, compromising the quality of the seal provided by the root filling. , The intracanal dressings must be removed from the root canals prior to the final obturation in order to obtain the best interface possible between the canal walls and the filling material. However, it has been demonstrated that Ca(OH) 2 pastes are not easily removed from the root canal system. A current efficient protocol for final debridement is an alternate rinse of EDTA and NaOCl. ,, A number of factors can influence the efficiency of irrigants in removing the smear layer, such as final apical instrument size, the size of the needle used for irrigant delivery, the length of time devoted to irrigation, and the volume of irrigant used. ,, All of these factors can affect removal of Ca(OH) 2 from the root canal. Margelos et al. showed that using 15% EDTA solution or NaOCl alone as irrigants does not remove Ca(OH) 2 from the root canal, but combining these two irrigants with hand instrumentation improves the removal efficiency. Thus, in the current study we used 17% EDTA and NaOCl combination plus circumferential filing with MAF to compare the effectiveness of the cleaning techniques. Salgado et al. showed that the recapitulation of MAF in combination with irrigants removed more Ca(OH) 2 medication than an irrigant flush alone. In our study, MAF in combination with irrigants removed more Ca(OH) 2 medication than the Canal Brush system. Canal Brush is an endodontic microbrush that has become commercially available only recently. It is a highly flexible microbrush and can be used manually with a rotary action. However, it is more efficacious when attached to a contra-angle handpiece running at 600rpm. Thus in our study, the Canal Brush was used with a contra-angle handpiece running at 600rpm. In the current study, our results were similar to the study of Keir et al,which is reported use of the Endobrush for improving canal debridement. Their results showed that Endobrush was significantly better than instrumentation alone in debriding the root canal; however, Endobrush was shown to pack debris into the apical section of the canal after brushing. In Group 2 (Canal Brush), remnant Ca(OH) 2 was found to be packed mainly in the apical third of the root in nearly all specimens. A difference in cleanliness was observed between the apical versus the middle and coronal thirds. It is clear that cleanliness of the coronal part of the tooth is more easily achieved than of the middle and apical thirds. In the current study, differences in cleanliness were observed between Group 1 and Group 2 in the apical thirds. The amount of residual Ca(OH) 2 in the canal was calculated by several methods such as a scoring method, a scaning electron microscopy a volumetric analysis by spiral CT and longitudinal sectioning. ,,, In this study, a scanning electron microscopy was used for assessment of the residual Ca(OH) 2 and the spectrum microanalysis was used to verify whether remnants were Ca(OH) 2 or debris. Our results revealed that the remnant was Ca(OH) 2 in each group [Figure 3]. Lambrianidis et al. showed that while the amount of Ca(OH) 2 powder in the paste does not affect the removal the vehicle used for making the paste can affect the retrieval. Simon et al. showed the pH of Ca(OH) 2 and release of Ca +2 from various vehicles and found Ca +2 release to be greater when distilled water was used as vehicle. In our study, powder form of Ca(OH) 2 was used in distilled water. It is essential to clean the canal walls using the hand instrumentation technique with MAF from hand instrumentation and with NaOCl and EDTA combination, before the final flush, to improve the removal of Ca(OH) 2. Canal Brush technique shows the packing effect of the Ca(OH) 2 through to the apex. 1. Kakehashi S, Stanley HR, Fitzgerald RJ. The effects of surgical exposures of dental pulps in germ-free and conventional laboratory rats. Oral surg Oral med Oral pathol1965;20:340-9. 2. Takahashi K. Microbiological, pathological, inflammatory, immunological and molecular biological aspects of periradicular disease. Int Endod J1998;31:311-5. 3. Grecca FS, Leonardo MR, da Silva LA, Tanomaru Filho M, Borges MA. Radiographic evaluation of periradicular repair after endodontic treatment of dog's teeth with induced periradicular periodontitis. J Endod2001;27;610-2. 4. Tronstad L, Andreasen JO, Hasselgren G, Kristenson L, Riis I. pH changes in dental tissues after root canal filling with calcium hydroxide. J Endod1981;7:17-21. 5. Kleier DJ, Barr ES. A study of endodontically apexified teeth. Endod Dent Traumatol1991;7:112-7. 6. Calt S, Serper A. Dentinal tubule penetration of root canal sealer after root canal dressing with calcium hydroxide. J Endod1999;25:431-3. 7. Kim SK, Kim YO. Influence of calcium hydroxide intracanal medication on apical seal. Int Endod J2002;35:623-8. 8. Margelos J, Eliades G, Verdelis C, Palaghias G. Interaction of calcium hydroxide with zinc oxide-eugenol type sealer: A potential clinical problem. J Endod1997;23:43-8. 9. Foster KH, Kulild JC, Weller RN. Effect of smear layer removal on the diffusion of calcium hydroxide through radicular dentin. J Endod1993;19:136-40. 10. Lambrianidis T, Margelos J, Beltes P. Removal efficiency of calcium hydroxide dressing from the root canal. J Endod1999;25:85-8. 11. Lambrianidis T, Kosti E, Boutsioukis C, Mazinis M. Removal efficacy of various calcium hydroxide/chlorhexidine medicaments from the root canal. Int Endod J2006;39:55-61. 12. Salgado RJ, Moura-Netto C, Yamazaki AK, Cardoso LN, de Moura AA, ProkopowitschI. 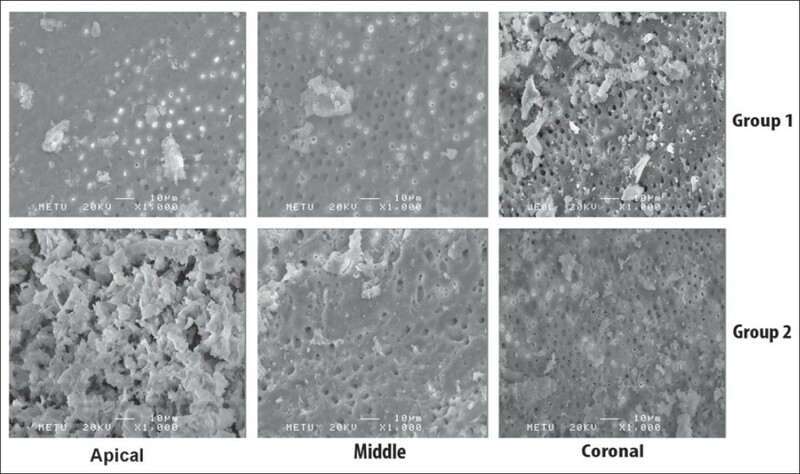 Comparison of different irrigants on calcium hydroxide medication removal: Microscopic cleanliness evaluation. Oral Surg Oral Med Oral Pathol Oral RadiolEndod2009;107:e580-4. 13. Kuga MC, Tanomaru-Filho M, Faria G, Só MV, Galletti T, Bavello JR. Calcium hydroxide intracanal dressing removal with different rotary instruments and irrigating solutions: Ascaning electron microscopy study. Braz Dent J2010;21:310-4. 14. Kenee DM, Allemang JD, Johnson JD, Hellstein J, Nichol BK. A quantitative assessment of efficacy of various calcium hydroxide removal techniques. J Endod2006;32:563-5. 15. Keir DM, Senia ES, Montgomery S. Effectiveness of a brush in removing postinstrumentation canal debris. J Endod1990;16:323-7. 16. Garip Y, Sazak H, Gunday M, Hatipoglu S. Evaluation of smear layer removal after use of a canal brush: An SEM study. Oral Surg Oral Med Oral Pathol Oral Radiol Endod2010;110;e62-6. 17. Paqué F, Musch U, Hülsmann M. Comparison of root canal preparation using RaCe and ProTaper rotary Ni-Ti instruments. IntEndod J2005;38:8-16. 18. Teixeira CS, Felippe MC, Felippe WT. The effect of application time of EDTA and NaOCl on intracanal smear layer removal: An SEM analysis. Int Endod J2005;38:285-90. 19. Mello I, Robazza CR, Antoniazzi JH, Coil J. Influence of different volumes of EDTA for final rinse on smear layer removal. Oral Surg Oral Med Oral Pathol Oral RadiolEndod2008;106:e40-3. 20. Zehnder M, Schmidlin P, Sener B, Waltimo T. Chelation in root canal therapy reconsidered. J Endod2005;31:817-20. 21. Khademi A, Yazdizadeh H, Feizianfard M. Determination of the minimum instrumentation size for penetration of irrigants to the apical third of root canal systems. J Endod 2006;32:417-20. 22. Sedgley CM, Nagel AC, Hall D, Applegate B. Influence of irrigant needle depth in removing bioluminescent bacteria inoculated into instrumented root canals using real-time imaging in vitro. IntEndod J2005;38:97-104. 23. GuL S, Kim JR, Ling J, Choi KK, Pashley DH, Tay FR. Review of contemporary irrigant agitation techniques and devices. J Endod2009;35:791-804. 24. Rödig T, Vogel S, Zapf A, Hülsmann M. Efficacy of different irrigants in theremoval of calcium hydroxide from root canals. IntEndod J2010;43:519-27. 25. Nandini S, Velmurugan N, Kandaswamy D. Removal efficiency of calcium hydroxide intracanal medicament with two calcium chelators: Volumetric analysis using spiral CT, an in vitro study. J Endod2006;32:1097-101. 26. Tasdemir T, Celik D, Er K, Yildirim T, Ceyhanli KT, Yesilyurt C. Efficacy of several techniques for the removal of calcium hydroxide medicament from root canals. IntEndod J2011;44:505-9. Kamal, A. and Behnaz, G. and Marjan, H. and Ali, M.A. and Sharare, M.Z. türker, s.a. and koçak, m.m. and koçak, s. and saglam, b.c.